Matty is back in Gameland and he has to Floss his way to Freedom! Picking up from where Game On left off, Game On 2.0 continues the celebration of gaming as a raucous celebration of the silly. Matty accidentally returned to Gameland and is stuck in the labyrinth of games. In order to get home he must make his way to safety from one game to the next while staying ahead of the evil villain pursuing him. Once again the audience needs to help Matty fight his way to freedom. In Pokemon Park the Pokemon have escaped and are getting even with eyerone who have been throughing balls at them. GTA is re-written and given a fun new twist as the audience joins a game of Granny Theft Auto. And, int he final show down, only one game is big enough to host the biggest boss battle of all time... Fortnite! Once again audience participation is set to the highest level. Matty Grey asks everyone to help him tell his story and the kids are delighted to participate. 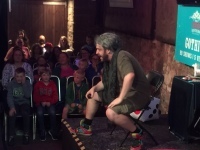 ​Game On 2.0 is a theatrical, stand-up comedy show for children aged 5 to 12 years. 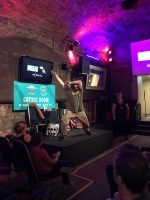 The show is structured by Matty Grey telling the story of his escape from Gameland, exploring aspects of play and gaming in a fun and highly interactive way. ​​Matty Grey is an experienced children's entertainer who has inspired a dedicated following with audiences around the country. His bright and brash character engages children and his performance style pitches his message at a level that the kids love. He talks with children rather than at them. This is not cutsie-pie gooey niceness - this is laugh-so-hard-snot-comes-out-your-nose type stuff! This show is tour ready and available for purchase at short notice. It is suitable for festivals, corporate events, commercial spaces and various other events. Technical requirements are minimal and the show can be adapted to suit most performance spaces.